Published: Nov. 20, 2016 at 11:55 p.m. Injuries are mounting in the NFL, but the trustworthy options to add off of the waiver wire are disappearing at a rapid rate. That's why below are several players who have appeared in this column in the past. That's not laziness, but simply the state of fantasy football as we approach the home stretch. If the 14 players covered below aren't available in your league, don't forget to read my weekly Deep Dive (published Mondays) to keep tabs on high-upside players potentially flying under the radar. For those who use the Free Agent Acquisition Budget (FAAB) system, I provide a suggested spend for each player at the end of their analysis. If you have more specific FAAB questions, hit me up on Twitter. One week after Ryan Mathews looked to be taking control of the Philadelphia backfield the team is once again beset with questions at running back. 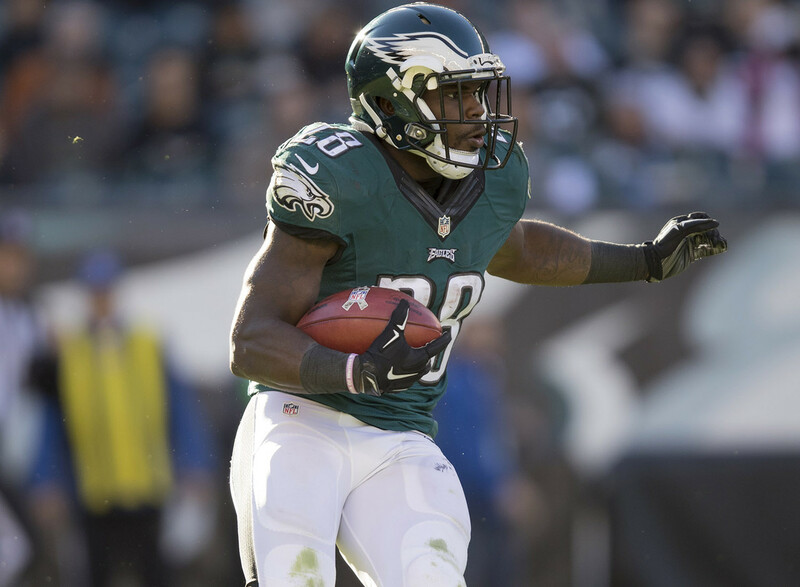 Mathews injured his knee against the Seahawks, while Darren Sproles left with a rib injury. Smallwood, a rookie, shouldered the load in their stead with 17 touches and 79 total yards. He'll likely take on that role again in Week 12 when the Eagles host the Packers, whose run defense has shown plenty of cracks in recent weeks. He's a must-add and will have immediate RB2 value if Mathews/Sproles miss time. FAAB suggestion: 25 percent. Starks' hold on the starting running back role in Green Bay might be tenuous, but for now he needs to be owned in more leagues. Ty Montgomery popped into the backfield again on Sunday night, but Starks led the way in snaps (51 percent) and touches (14) for the Packers. Christine Michael lurks to steal work in the coming weeks (I'll have more on him in Deep Dive tomorrow), but for the moment Starks is the featured back in an offense still capable of putting up points in bunches. That makes him worth an add this week. FAAB suggestion: 15-20 percent. Fat Rob just keeps eatin' in Washington's backfield. After usurping the starting job from Matt Jones (a healthy scratch again) in Week 8, Kelley has averaged 4.86 yards per carry on 66 totes with four touchdowns and, most importantly, no fumbles. Kelley has a tough schedule coming up, but needs to be owned in all leagues at this point. His ceiling is capped by his lack of involvement in the passing game, but two-down power backs can be relevant in fantasy when on high-powered offenses, which is the case with Kelley in Washington. FAAB suggestion: 20-25 percent. In his first game action of 2016, Lewis saw five carries and five targets while playing 20 snaps, just two behind James White. It was great seeing No. 33 out there again making crazy jump cuts and catching passes from Tom Brady. Lewis should be scooped up this week, especially in PPR leagues, as he could siphon away more playing time and touches from White in the coming weeks. Lewis was an every-week RB2 last season, and could push for similar value before the curtains fall on the 2016 fantasy season. FAAB suggestion: 10-15 percent. Head coach John Harbaugh intimated last week that he wanted to get Dixon more involved, and proceeded to give his rookie 41 percent of the backfield opportunities on Sunday. Unfortunately, that amounted to just six carries and one target as the Ravens oddly avoided using their backfield for pretty much the entire second half. It'd make sense for the Ravens to recommit to the ground game after falling to the Cowboys this week. They take on a Bengals team that could be on the precipice of a free fall after losing A.J. Green and Giovani Bernard Sunday. Dixon will have low-end flex value in PPR formats with the potential for more if he dethrones West at some point down the stretch. FAAB suggestion: 5-10 percent. LeSean McCoy is set to have surgery on his thumb this week, but could still play on Sunday. The surgery (and injury) don't appear to be serious, but Gillislee should be added regardless. McCoy has already missed time with other injuries this year, and there's a chance the team could lighten McCoy's workload on Sunday considering he'll be playing mere days after surgery. Either way, Gillislee needs to be targeted this week. FAAB suggestion: 5-10 percent. The knock on Matthews during his recent hot streak was that he was touchdown-dependent with six scores in six games despite only having more than 65 yards once in that span. Well, Matthews bucked that trend in Week 11 catching nine passes for 122 yards on 13 targets (the most any Titans wide receiver has seen all year). For weeks now Matthews has been growing into the role of the No. 1 wide receiver in Tennessee. It's time for fantasy owners to give him the same respect as well. FAAB suggestion: 15 percent. Believe it or not, Meredith is suddenly the top option in the Bears passing attack. With Alshon Jeffery suspended for three more games and Zach Miller now out for the season with a broken foot, Meredith should see plenty of volume moving forward. While his four targets this week weren't great against a tough Giant secondary, his schedule opens up with plus matchups against the Titans, 49ers, Lions and Packers in the next month. He'll be a risky flex play, but his target share should at least allow for serviceable fantasy weeks. FAAB suggestion: 10 percent. First of all, let's pour some out for A.J. Green, who suffered a torn hamstring in Week 11 and is likely done for the season. Now the Bengals will have to pick up the pieces and cobble together a passing attack without a true No. 1 wide receiver. LaFell led the team with nine targets in Week 11, but Boyd was the more productive player with 54 yards and a touchdown on eight targets. Both should be added, but probably left on the bench next week when the Bengals travel to Baltimore to face the vaunted Ravens defense. FAAB suggestion: 5-10 percent. Hill continues to get out-snapped by Albert Wilson and Chris Conley, but he's been the Chiefs' most productive wide receiver the last few weeks. He's been targeted at least five times in four consecutive games and is getting work in the ground game as well. As long as Jeremy Maclin remains sidelined, Hill will be a high-upside flex option in standard and PPR formats. The Chiefs travel to Denver next week, though, so Hill should probably be left on the bench. FAAB suggestion: 5-10 percent. Since returning from injury in Week 8, Ebron averages just shy of eight targets per game and has been extremely productive with his opportunities, too, averaging 10.6 fantasy points per game over his last three contests despite only finding the end zone once. Ebron's 23 targets since Week 8 barely trail Golden Tate (25) and Theo Riddick (24) on the team. He'll be a TE1 the rest of the season, including in tough matchups like he faces next week when Minnesota comes to Detroit on Thanksgiving. FAAB suggestion: 15-20 percent. Fiedorowicz has yet to play in Week 11, but since Week 4 he's first or second on the team in targets, receptions, receiving yards and touchdowns. In terms of fantasy, from Week 4 to Week 10 he clocks in as the TE7 in standard scoring. Brock Osweiler's has developed a preference for checking the ball down instead of challenging teams vertically due to his limitations as a passer. This boosts Fiedorowicz's value, and it is something that doesn't figure to change moving forward, either. FAAB suggestion: 5-10 percent. Kaepernick is the poster boy for how fantasy football and real football are different. No one is going to tell you Kap is playing quarterback particularly well right now, but he has been an outstanding fantasy quarterback since assuming the starting role. He's scored 18-plus fantasy points in four of his five starts, and next faces a Miami defense that was allowing over 17 points per game to the position before stone-walling Jared Goff in his first NFL start. Kap will be a top streaming option in Week 12, assuming Chip Kelly doesn't make a switch back to Blaine Gabbert. FAAB suggestion: 0-5 percent.